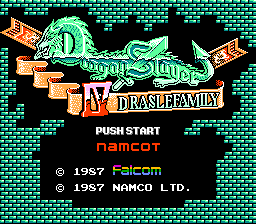 Dragon Slayer IV Drasle Family (ドラゴンスレイヤーIV ドラスレファミリー, Doragon Suraiya IV Dorasure Famiri?) is a fantasy-themed, action-adventure platform game released for the MSX, MSX2 and Famicom in Japan and for the NES in the United States. It is the fourth installment in Falcom's Dragon Slayer series. Falcom directly published the two MSX versions, while Namco published the game for play on the Famicom. 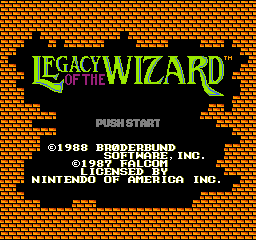 Brøderbund then licensed the Famicom version and published it in the United States as Legacy of the Wizard. The game is considered to be quite difficult as the game presents a rather sprawling dungeon/labyrinth to the player with little to no explanation or direction to follow. Only trial and error can guide the player in determining what steps to take to complete the game. The MSX and MSX2 versions differ in some key ways. The MSX2 graphics are improved and updated over the MSX version. The placement of key items has also been shifted around in the MSX2 version. The daughter's portion of the map is almost completely redesigned. The Famicom/NES version of the game appears to combine the original level arrangement of the MSX version with the improved graphics of the MSX2 version, while adding smooth scrolling to the presentation, as the MSX systems were known to have poor scrolling capabilities. The game chronicles story of the Drasle (abbreviation of "Dragon Slayer") family's attempt to destroy an ancient, evil dragon named Dilgyos ("Keela" in the localization) that is magically entrapped in a painting within an underground labyrinth. 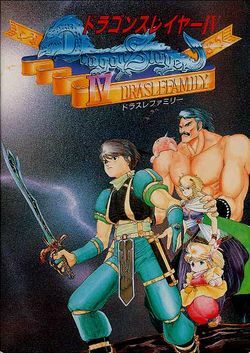 The only way the Drasle family can accomplish their goal is to use the "Dragon Slayer", a magical sword that is protected by four hidden crowns. The player must use the unique abilities of each member of the family to regain possession of the crowns, so that they may use the Dragon Slayer to defeat the evil Dilgyos. A long, long time ago a woodcutter's family lived in a small woods. One day, inside their house, the grandmother was talking to her grandchildren. "Long, long ago there was an evil dragon that was terrifying the people. A wizard came from the north country, captured the dragon, and put it deep in the ground. See the picture on the wall? The wizard is your grandfather." Just as the grandmother pointed at the picture, their pet dog "Pochi" came in with a shiny, pointed object. It was a scale from the dragon! Mother and Father both felt the dragon was about to revive. So they started to get ready to go to the dungeon. Their mission was to destroy it. The kids cried: "There's no way that you can ever beat the dragon!" Father smiled and said: "Don't worry, there is a DragonSlayer". "DragonSlayer" is a magical sword, the only weapon that can destroy the dragon. However, it is protected by four hidden crowns. The kids said: "We can help you find the crowns if it's OK with you". "Sure, if we can all help each other, we will be able to defeat the dragon", the Father replied. Where are the four crowns? Can the Drasle family destroy the dragon? Now the adventure begins. This page was last edited on 10 March 2018, at 03:56.